A backyard swimming pool will provide years of enjoyment for family activities and entertaining. Whether you enjoy relaxing afternoons floating in the water or playful pool parties with the kids, a swimming pool offers fun in the sun. A pool will add beauty and visual interest to any landscape. Swimming pools have become synonymous with relaxation and rejuvenation, inviting features that homeowners look for in today’s modern homes. Backyard pools provide a tranquil retreat where you can escape daily stress and get some needed exercise. By adding a waterfall to your pool, you can create soothing water sounds that will make your pool feel like a tropical oasis. Take a look at some NJ pool waterfall ideas that will take your breath away. Rock waterfalls provide a natural looking setting that enhances most swimming pool designs. If you’re lucky enough to live in a rural Bergen County area where rocks and boulders are abundant in your landscape, you can work with natural rocks. However, the size and weight of large, natural rocks may prohibit their use in your pool waterfall. Most rock waterfalls built for backyard swimming pools are made from man-made rocks that mimic natural rocks in the landscape. Rico Rock is a made-made product made from a high-tech concrete mix with fiber reinforcement. It’s stronger and lighter in weight than real concrete and large, natural rocks and boulders. It provides an easy solution for a swimming pool rock waterfall, but requires a skilled mason for installation. Various waterfall designs and sizes can typically be installed within a few days. You can purchase pre-fabricated rock waterfalls through several manufacturers. They come in various sizes, shapes and colors to enhance any swimming pool size, shape and design. They’re made from durable, rugged, light weight polyurethane and often come with optional boulder accent packages for a more rustic appearance. You’ll find a variety pre-fabricated pool waterfall ideas in NJ to fit your style and your budget. Caves and grottos with waterfalls create a sense of mystery in your swimming pool. They hint at secluded entryways hidden by cascading waterfalls that entice swimmers to explore what’s behind. Typically surrounded by rocks and lush foliage, they offer swimmers a unique place to relax and cool off in the shade. Swimmers can enter under a unique waterfall and relax on rocks, benches or floating rafts while they watch the waterfall spilling over in front of them. Many caves and grottos also include special features like swim-up bars with underwater stools, fiber-optic lighting that changes colors, relaxing hydrotherapy jets and sophisticated, waterproof sound systems which create the perfect pool atmosphere for entertaining. Just imagine the possibilities of an intriguing cave or grotto with a stunning waterfall at the entrance. Since swimmers actually swim into caves and grottos, proper overhead support is crucial. If you’re excited by the idea of pool waterfall ideas in NJ that include a cave or grotto, consult a professional, experienced landscape contractor, like Borst Landscape & Design, who can ensure that your cave or grotto waterfall is properly constructed for the safety of swimmers. If you want a swimming pool with dramatic ambiance and unique design appeal, consider adding a waterfall with fire features. Fire near the pool not only creates a sparkling glow in the water, it also provides light and warmth for swimmers, a welcome feature for evening swims. Whatever the size and style of your pool, you can create stunning effects in your backyard with pool waterfall ideas that include fire features. If you have a contemporary or modern home and pool, emphasize simplicity with a waterfall that reflects straight, clean lines. Choose a side or end of the pool and build an elevated ledge in concrete or stone that supports a simple waterfall with fire. To enhance modern design elements, incorporate stainless steel or glass accents and make sure you build a long, narrow spillway that creates a subtle waterfall with no splash. Traditional-style pools look great with waterfalls that create more splash for swimmers. You can build a cascading rock waterfall with fire exploding from the top, a multi-level waterfall with fire on different levels or a stone waterfall with a slotted fire feature. For added ambiance and warmth, place large urns with fire features along the perimeter of the pool, so swimmers can relax on the pool ledge and warm up after a swim. If your swimming pool has a spa or jacuzzi that connects to the pool, you can add a waterfall that flows from the ledge into the pool below. Since spas and jacuzzis are typically elevated above pool level, it’s easy to build a waterfall that spills into the pool. The added splash and running water sounds from the waterfall will create a focal point with visual interest and relaxing ambiance for both the pool and the spa. If your spa or jacuzzi is separated from the pool, consider NJ pool waterfall ideas with a waterfall that flows from the spa to the pool. You can create a flowing waterfall with a natural stream of water that flows over rocks, stepping stones or landscaped areas. It will suggest a natural pathway from the spa to the pool and enhance your landscape with soothing water sounds. For added ambiance and safety after dark, line the waterfall pathway with soft landscape lighting in fixtures and finishes that complement the style of your home. Swim-through, overhead waterfalls create fun and excitement for swimmers, as well as unique design appeal for your pool. With creative inspiration for pool waterfall ideas NJ, you can create overhead, swim-through waterfalls for any size and style swimming pool. When designing swim-through waterfalls, consider pool materials, the shape of the pool and surrounding landscape features. Most modern pools are built with materials that emphasize simple design features. Typically, they are built in square or rectangular shapes that emphasize simplicity with the use of straight lines and sharp angles. By constructing an overhead beam with supports, you can create a swim-through waterfall that sits two feet or ten feet above the pool. Although many traditional pools are rectangular, others are built with curves and more flowing shapes like figure 8s. For softer appeal, consider an arched or curved overhead swim-through feature that enhances the softer lines of the pool. To enhance traditional style, consider adding hanging vines or water plants to the overhead structure for natural appeal. A flowing waterfall will enhance any style pool with relaxing ambiance and soothing sounds, but you can add even more design appeal with special waterfall features that create unique interest. Infinity edges completely disappear, creating the feeling of infinite pools of water. Pools and waterfalls with infinity edges are great for multiple levels where water can flow effortlessly from one level to the next. LED lighting provides NJ pool waterfall ideas that create outdoor fun and unique atmosphere. Light up your pool waterfall with soft white light for sophisticated ambiance or green, pink, red, blue and yellow hues for lively backyard pool parties. Whether you have a pool waterfall with simple, modern features or one with cascading levels of rocks and boulders, lush greenery and colorful water plants will add natural appeal and soften hard edges. If you’re interested in adding a relaxing waterfall feature to your Bergen County pool, talk to the landscape professionals at Borst Landscape & Design who can help you with design, construction and installation. 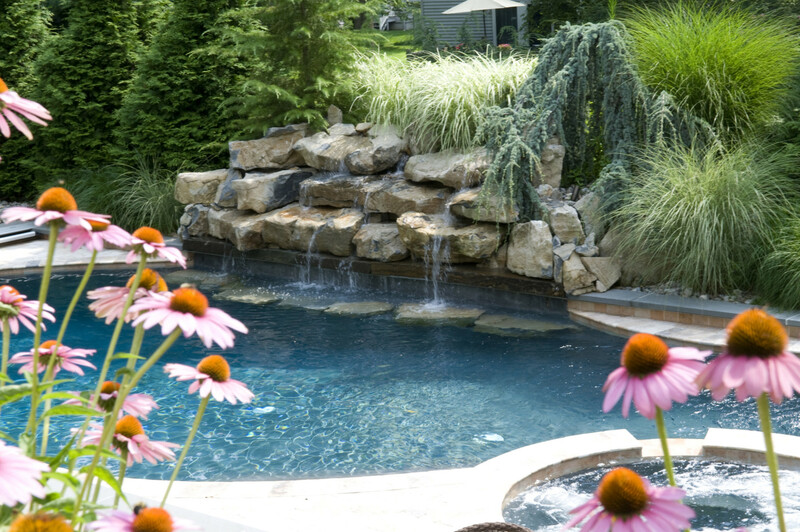 A pool waterfall will add beauty, visual interest and tranquility to your backyard landscape.